Boca Raton Mayor-Elect Scott Singer with Florida Armenians Editor Taniel S. Koushakjian at the Singer Victory Party on Election Night. 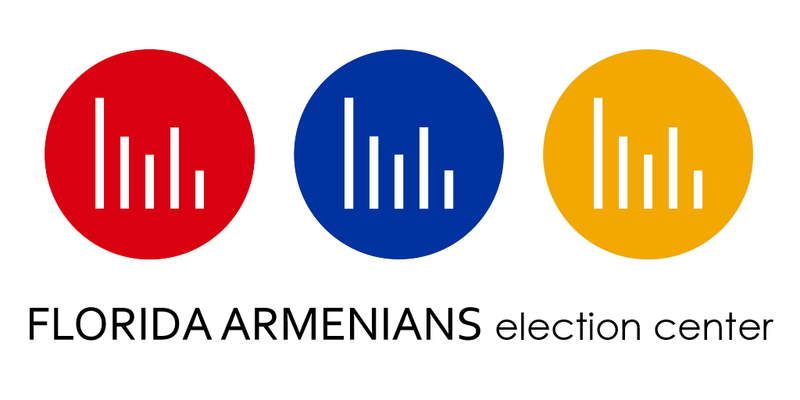 In the City of Boca Raton special election that took place on Tuesday, August 28th, Florida Armenians endorsed candidate for Mayor, Scott Singer, overwhelmingly won his election against challenger Al Zucaro, 63.5% to 33.5%. Singer has been a great friend of the Armenian American community in Boca Raton for many years. In the three-way race to succeed Singer on the Boca Raton City Council, attorney Andy Thomson defeated his two opponents, capturing 44.15% of the vote. This race was too close to call on Election Night, with Thomson down the majority of the night. A hand recount was ordered by the Boca Raton Supervisor of Elections, which saw Thomson, who was down by 3 votes, prevail by 33 votes when all was said and done. Florida Armenians congratulate Mayor Scott Singer and Councilman Andy Thomson on their election victories and we look forward to working with them on the important issues facing their Armenian American constituents in Boca Raton. 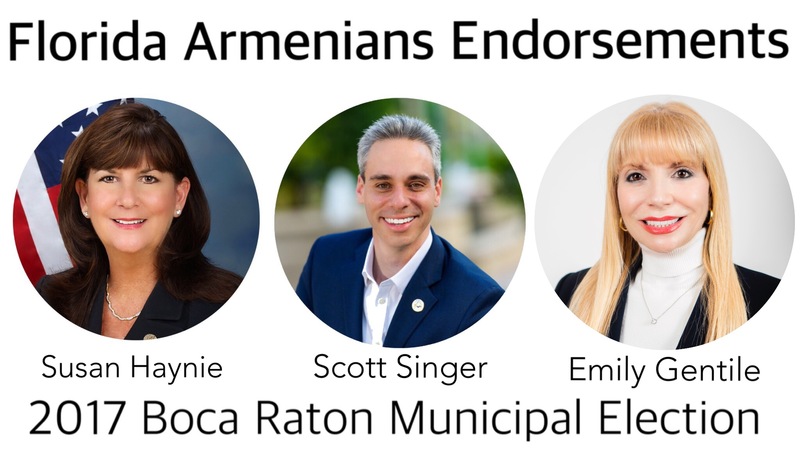 BOCA RATON, FL – Florida Armenians is pleased to announce our endorsements in the upcoming Boca Raton municipal elections. The City of Boca Raton 2017 Municipal Election will be held on Tuesday, March 14, 2017. Polls will be open 7:00 am to 7:00 pm. Electors of the City will vote for candidates for Mayor, City Council Seat A, and City Council Seat B.
Florida Armenians endorses Susan Haynie for Mayor, Scott Singer for City Council Seat A, and Emily Gentile for City Council Seat B. Mayor Haynie and Councilman Singer have been friends of the Armenian community of Boca Raton for many years. Last year, Mayor Haynie, Councilman Singer, and others on the City Council introduced and passed a resolution commemorating the 100th anniversary of the Armenian Genocide. In addition, both Haynie and Singer have served the city well in their first term in office and deserve re-election. Haynie has helped guide the city, manage sustainable growth, and boosted a pro-jobs environment. Singer has been a strong advocate for citizen activism and participation in government, as evidenced by his many in-person and telephone town-halls. In the open race to succeed term-limited Councilman Mike Mullaugh, Emily Gentile is the clear choice. She has the strongest record of city involvement and activism – having served in leadership positions on over a dozen city boards, civic groups, and local charities – unlike her opponent Andrea O’Rourke who has limited community involvement, and Andy Thomson who moved to Boca Raton 7 months ago and hasn’t served on a single city board. O’Rourke and Thomson represent two extremes of the anti-growth and anti-development vs pro-growth and pro-development political spectrum, respectively; whereas Gentile takes a balanced approach, mindful of all parties and interests, and will add decades of knowledge and experience in community affairs and problem solving to the city council. Councilman Mullaugh, as well as former Massachusetts Senate Majority Leader Linda Melconian who helped spearhead the state’s Armenian Genocide education curriculum, have endorsed Emily Gentile for Boca City Council, among others. She recently visited St. David Armenian Church in Boca Raton, FL and met with dozens of community members. Florida Armenians is proud to endorse these great community leaders and looks forward to working with them in the years to come.